Here’s a photo showing our latest awards. 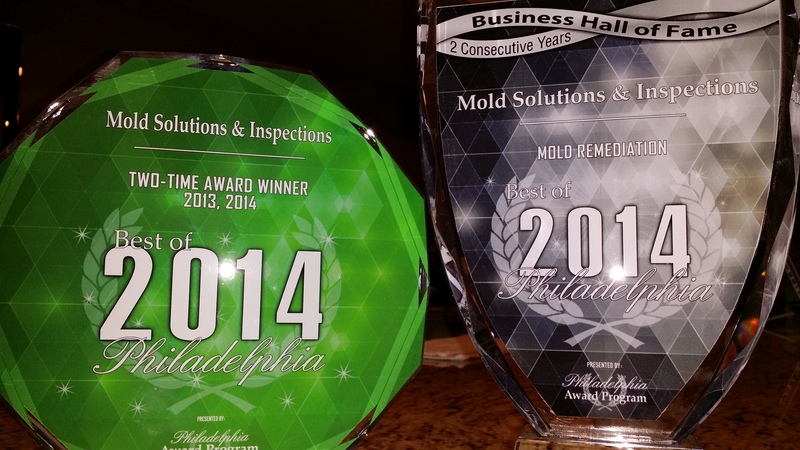 On the left is the 2014 Best Of Philadelphia Award for Mold Remediation which we’ve now won two straight years in a row. We also were inducted into Philadelphia Business Hall of Fame for 2014 which is on the right. Hard work and dedication from every member of our entire company makes us the highest rated Restoration contractor in our area. As the summer is behind us and fall is approaching, take a few moments to review some fall fire safety tips that can prevent disasters in your home. As we prepare to fire up the furnace for another season of hard work, it is important to have your system professionally inspected, cleaned and serviced. Filters need to be changed or cleaned, and make sure combustibles are stored at least 3 feet from the furnace. Have any alternative heating sources checked out as well, such as wood-burning stoves. Before plugging in your space heaters for the first time, inspect them for damage, check the cords and know how to operate the units safely. Make sure that an adult is keeping an eye on the heaters when they are in use, and keep them away from combustibles and out of the path of children and pets. Everyone likes to get close enough to feel the heat, but too close can be dangerous. November, December and January account for a larger percentage of residential structure fires than any other three months in the year. Keep decorations away from exit paths, and check cords for fraying before plugging them in for the holiday. • Replace the batteries at least once a year. • Clean dust from smoke alarms with a vacuum attachment. • Replace units that are over 10 years old. • Push the test button monthly to ensure proper operation. • Have an outside meeting place where your family will meet in case of an unwanted fire. Run through some practice drills to make sure everyone knows what to do and where to go. Carbon monoxide, or CO, alarms are an important part of your home safety plan. They detect unburned gases that may leak from gas burning appliances. They must also be tested monthly and have batteries replaced annually. Many people use candles in their holiday decorating to create a festive and warm atmosphere. In many cases, candles can lead to home fires when they are left unattended and ignite nearby combustibles. Use sturdy candle holders that are large enough to collect candle wax and are resistant to tipping over. Keep candles up and out of the reach of children, and do not allow candles in the bedrooms.